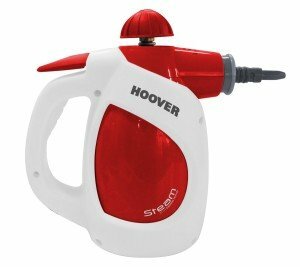 As the name indicates, handheld steam cleaners should be light enough to hold. Generally most handheld models on the market come with nozzles and sprayers so that they can be used on a variety of areas in your house. 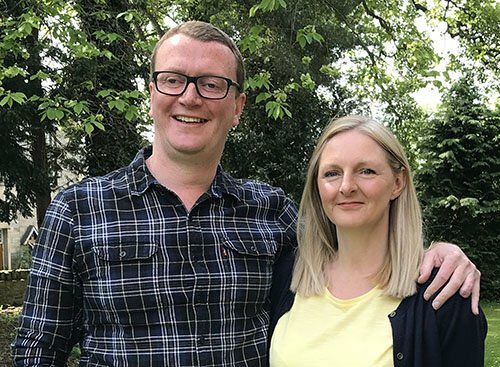 They are very cost-effective, as with one appliance you can clean almost anything right from your clothes to wardrobes to kitchens to bathrooms and showers to windows. The uses of these cleaners are endless! When looking at a handheld steamers, first and foremost, you should note that handheld steam cleaners should be purchased only if you are looking to clean small areas like grills, BBQs, tiles etc. Due to their compact size, they cannot be used to clean bigger areas but are ideal for cleaning cars, carpets and furniture. If you are looking to clean larger areas, you should consider buying steam mops or cleaners, but these are bigger and heavier (and more expensive). 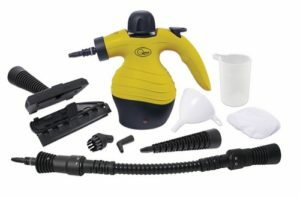 Below you will find our reviews of the best selling hand held steam cleaners. 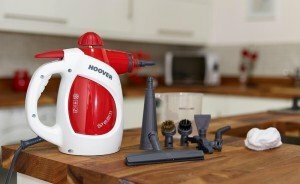 The Hoover SSNH1000 is one of the best selling handheld steamers in the UK and a highly rated Best Buy. This is a high pressure hand-held steam cleaner which uses the pressure of its steam to clean off stubborn grime. This model from Hoover is one of the lightest models available in the market, which makes it easy to carry around. With this handheld unit, you can wipe off all traces of grime from the tops of ovens, grills and other small areas. When you buy this, you also get a several accessories including nozzles, shovel plates, brushes and combs for better and effective cleaning. The steam cleaner consistently achieves high ratings and it’s easy to see why with the combination of good features and competitive price. Lightweight and Compact Design: The Vax S4 is very light allowing you to clean windows, mirrors and other vertical surfaces. It also makes its storage much easier. This handheld design allows you to clean places that were hard to reach before. Variable and Adequate Steam: This steam cleaner allows you to adjust the amount of steam with regard to the surface being cleaned. The Grime Master allows you to enjoy up to 10 minutes of steam power given the 260 ml water tank. It allows you to clean curtains as well with ease. The powerful steam helps in removing steam easily on different types of surfaces. Accessories: A 7-piece accessory kit provides everything you need to clean your home. 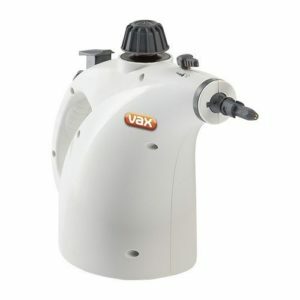 Vax include a brush, mattress/upholstery tool, concentration nozzle, cotton cloth, tile tool, pouring jug and an extension tool. This allows you to use this Vax as a spot cleaner. 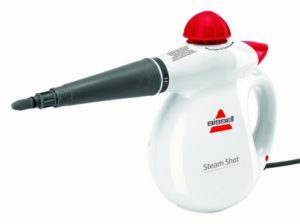 This is a compact and easy to use steam cleaner, offering a one hand operation. It comes with multiple attachments and a large capacity water tank which makes the cleaning process much easier. One great aspect is the inclusion of a very comprehensive manual. Despite being hand held, this steam cleaner performs poorly when held at an angle because its heating element is found at the base. Placing it at an angle can result in gurgling and spitting. Ergonomic Design: The Bissell 2635S weighs only 2.3 kg plus it comes with a 4.8 m cable. As a result, its very portable and easy to use. This compactness allows you to clean up multiple surfaces without strain. Tools: This model comes with up to six accessories which are provided to make the cleaning process much easier. They include an extension hose, a detail brush tool, a nozzle, a flat scrapping tool for removing sticky mess, a grout brush tool, fabric steamer tool, an angle concentrator and a window squeegee tool. High Pressure and Reliable steam: It makes use of sturdy nozzles to deliver high pressure steam which removes greasy stains. A 360 ml water tank allows you to clean large surface areas. An indicator light is used to monitor the amount of steam. A sizeable extension hose allows you to clean hard to reach places. Blasts of steam eliminate the need for chemicals and scrubbing. Not recommended for large scale cleaning applications. The switch for the activation of the steam has been reported as occasionally faulty. Power: The Quest makes use of 100 watts to deliver steam at high pressure. Its very effective in removing stubborn dirt and killing bacteria. A powerful and hot steam makes way into greasy stains and food spills allowing you to clean kitchen surfaces and appliances much easier. A light is used to signal to the user when the steam is ready. Accessories: It comes with multiple accessories which allows you to clean all places in your home. You can also clean clothes, curtains and upholstery around your home. The Quest is easy to use with a simple set up. It gets rid of greasy stains on appliances with a quick application and can easily remove limescale from your sink and draining board. The lead is a bit short which makes its hard to clean places like your bathroom. The heating element takes up space which would have been used to hold more water.